please... walkthrough?!?! ?1 I need help in pharmacy. I am trying to complete the large poster (picture) thingie. I put the leaves in it. I put the frog on it. I put the diamond on it. I put the firewood on it. What am I missing? I have leaves, grapes, and some pearls and a few bottles of air, fire, etc. in inventory. None of them work on the picture and I am now stuck. Is there a walkthrough? Please? I won't purchase anymore without SG or walkthrough. Re:please... walkthrough?!?! ?1 I need help in pharmacy. There certainly is a walkthrough for Amulet of Time: Shadow of la Rochelle available, which you can find here. If a game has a walkthrough, it will be located at the top of the Forum. Hi Sjsullivan-I'm having issues with this puzzle as well. 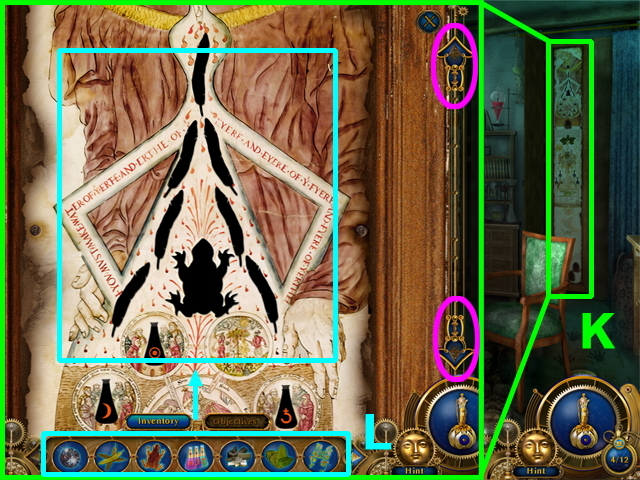 Unfortunately, the screenshot provided in the walkthrough captures the puzzle in its incomplete form which isn't helpful at all. Hopefully I'll figure it out soon via a process of elimination...If so, I'll post the solution here.